Plantar Fasciitis is often diagnosed by pain in heel, especially when you wake up in the morning or when when you get up after having some rest. However this pain reduces within an hour, but again comes back after taking some rest. Previously experts used to think that it is due to bony growths called heel spurs, but now they know that heel spurs occur as a side effect of untreated Plantar Fasciitis. What is Plantar Fasciitis ? 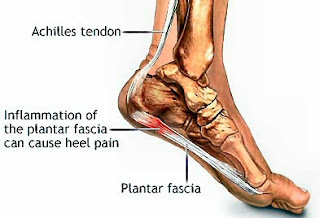 Plantar Fasciitis is pain due to tiny tears in Plantar Fascia. Plantar Fascia is a thick band of tissues reaching from heel to your toes, which acts as a shock-absorbing bowstring supporting the arch in your foot. Tiny tears in it occur due to various reasons and it may result in pain, especially when you get up after several hours of rest. Around 10% population faces this type of pain in heel at least once in a lifetime, which makes it a common health issue. Women are more prone to this disease, but it can also occur in men. It is a common problem among athletes, and most of the athletic foot injuries account for Plantar Fasciitis. Our foot contains 25% of all bones in body, i.e. 52 to be precise. These bones give proper support to arch of the foot to bear the body weight in different positions and do the pushing movement. If some of these bones go out of alignment due to some reason, then it may result in Plantar Fasciitis. What causes Plantar Fasciitis ? Flat-foot people are more prone. Hours of continuous driving can also result in Plantar Fasciitis, as there you need to continuously push the pedals. Sudden weight gain is also associated with Plantar Fasciitis, which makes women more prone to this disease, as pregnancy causes rapid weight gain. Ageing also makes you prone to this disease, as Plantar Fascia becomes rigid. Ageing reduces elasticity of some body tissues and makes them rigid. Treatment of Plantar Fasciitis depends on severity of the condition. If the pain is bearable and you can walk easily then it may subside itself within 10 - 15 days. But if the condition worsens and the pain does not go away then you may need to see a medical practitioner or a specialist. In the mean time you may do following treatments at home to get some relief. Rest: Ample amount of rest, even during the day time gives your body the time it needs to heal the micro-injuries. Icing: Apply ice to your heel for at least twenty minutes twice a day. It will reduce the redness and swelling of tissues. Stretching: Simple stretching exercise twice a day improves blood circulation to any tears or micro-injuries in Plantar Fascia, which is must to heal any injury. It also strengthens the muscles and ligaments around it. Support: If the pain is more then heel seats, night splints, heel wraps, or taping can help you by providing more comfort to your heel. Stop wearing improper footwear: If any footwear was the real culprit behind your condition, then you must abandon it before it makes the condition worse. Good news about Plantar Fasciitis is that 90% cases get resolved with proper treatment within few months. Most common exercises to treat Plantar Fasciitis include stretching exercises that stretches your feet and calf. You may search for such exercise videos, which may be more beneficial. Most of the above mentioned yoga poses gives proper stretch to your foot, leg and calf muscles which makes them a proper yoga to get relief from Plantar Fasciitis. But if you feel uncomfortable in doing any of the above yoga, then it is better not to practice it. Note: If you are not above 50 and facing Plantar Fasciitis without any sudden weight gain, then it might be due to excess stress on your foot, improper footwear or a combination of both. A proper treatment is must for this medical condition, as if it remains untreated then it may result in knee, hip or back problems. Height: 1' 2' 3' 4' 5' 6' 7' 0" 1" 2" 3" 4" 5" 6" 7" 8" 9" 10" 11"
Your small help is a big motivation for us. Please fill some more details to get better results. Subscribe to our email newsletter & receive updates right in your inbox for free.